it has more fiber, you may have been misled. Believe it or not, choosing a starchy carb because it’s higher in fiber or it has a lower glycemic index is actually amateur advice. Now keep in mind, if you’re not an exerciser this will probably be irrelevant because your metabolic needs are not the same as those of us who exercise intensely. Choosing a sweet potato or brown rice over the white stuff is a great choice, because your body doesn’t really NEED pure glucose like an exerciser does. But if you engage in frequent exercise on a weekly basis, your body will tolerate (and needs) PURE glucose that you get from white starches like white rice and potatoes. Here’s a quick example so you understand the big picture and you can take this advice seriously. 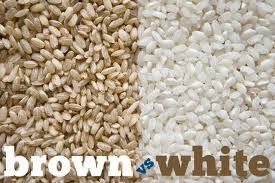 First off, the main difference between white and brown rice is the processing and nutritional content. Basically, only one layer (the outermost) is removed when producing brown rice. When white rice is produced, everything is removed leaving only the starchy component. This means pretty much all of the key vitamins and minerals in white rice are lost, including the fiber. Now you can see why we’ve been told to use brown rice instead of white rice. And when we’re trying to eat healthy balanced meals and keep blood sugar stable throughout the day without exercise, this is the best choice. But there’s way more to the story because there are times when all we should care about is the pure starch. This is especially true if we want to promote a healthy metabolism and burn more fat. You should easily be able to get adequate fiber from whole fruits and fresh veggies everyday, so trying to get more fiber from starches is waste of time (in my opinion). get from whole grain / whole wheat foods. Additionally, these pure glucose-based white starches also fuel a necessary metabolic process called “glycolysis”, which fuels anaerobic activity. This is SUPER important for long term fat-loss as well. They’ll keep your metabolism healthy and help your body utilize carbs as fuel more efficiently as fuel source for the long haul. Just make sure you combine your starches with high quality animal proteins and try to consume the majority of them after high intensity exercise. This will ensure your body utilizes them properly and prevent them from “spillover” over and being stored as fat on your body. But remember, if you’re NOT an exerciser I still recommend you eat more like a caveman (aka – Paleo), limit your intake of all starches and monitor fruit intake more closely. What Kind of Look or Body Type Do You Want?